I love garlic, but whenever I peel and chop it my fingers end up smelling like garlic for the rest of the day. I haven’t resorted to buying peeled garlic (yet!) and I recently just discovered a new garlic peeling trick at saveur.com. All you do is crush the cloves (they suggest using the heel of your hand, I use the flat of my knife) then dump them into a bowl. Put another same sized bowl on top, hold them together and shake. The shaking rubs all the cloves together and somehow their skins fall off. 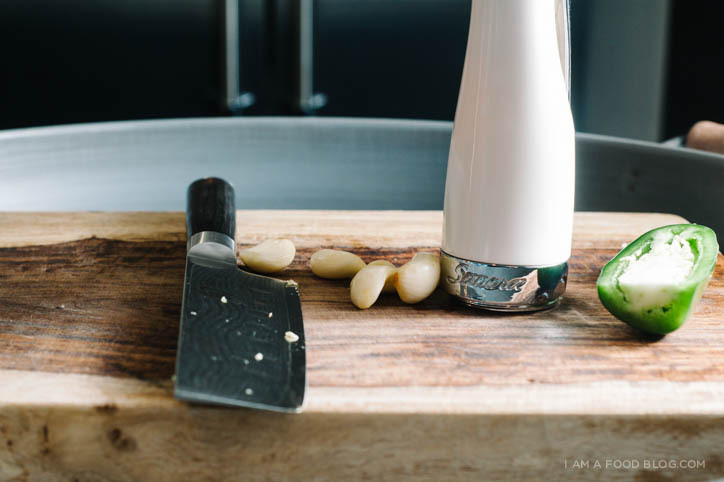 i heart my savora garlic press! I guess garlic is just one of those things – it takes a little effort for a lot of reward. It’s so delicious that I guess I don’t mind my garlicky hands. Garlic is one of the things I always have on hand, so it’s a starting point for a lot of my throw-it-together recipes. On this particular day the fridge had chicken and jalapeños. A quick check in the pantry for honey and it was honey garlic jalapeño chicken for dinner. This recipe is fast, especially if you’re willing to forgo the marinating time. I just marinated while the grill was heating up, which wasn’t very long at all. If I have the foresight to marinate meat, I do it, but usually I’m looking in the fridge an hour before dinner time wondering what I’m going to make. For times like that, I say forget the marination time. The honey, garlic and jalapeños are flavourful enough without the extra time. I love the subtle spice of the jalapeño with honey and garlic. Mix the garlic and jalapeños in a small bowl and divide into two, reserving half of the mixture. Place the chicken thighs in a shallow dish and season generously with salt and pepper. Add half of the garlic and jalapeño mix and two tablespoons of oil. Marinate for an hour if you have the time, otherwise, just go ahead and cook. 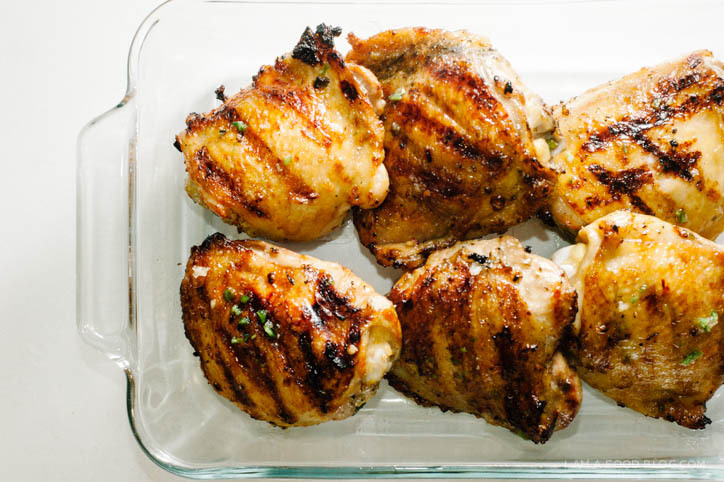 Grill or pan fry the chicken thighs on medium heat until the thighs are cooked through, 20-30 minutes, flipping as needed. While the chicken is cooking, mix together the reserved garlic and jalapeños along with the honey and water. 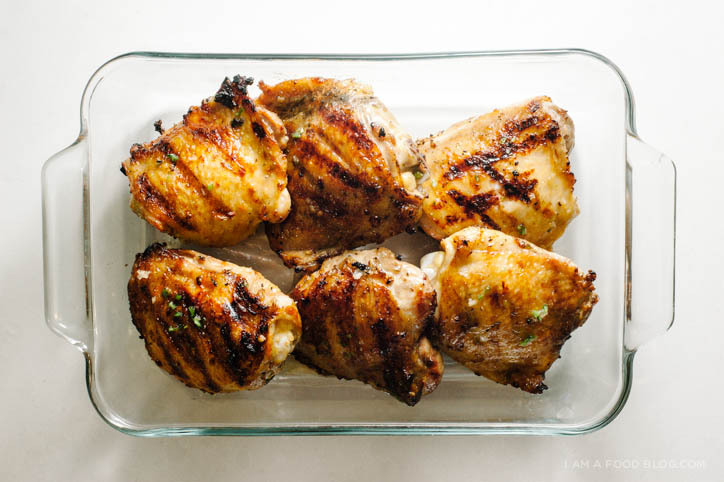 If grilling, brush the thighs with the honey mixture and grill until golden and sticky. If cooking on the stove top, add the honey mix to the pan and turn the heat up to medium high and reduce to a glossy sauce. Enjoy immediately. PS – If you like this recipe, order my cookbook, Easy Gourmet, today! It’s super on sale right now (37% off!). I had been one of your silent readers back when you were still on the Momofuku project. I lamented the day you stopped posting on that website but kept coming back every so often saying a little prayer each time that there will be a new post. I guess my prayers are answered because not only was there a new post, there’s an entire new site! Yay for more awesome food pics and recipes. You truly are an inspiration! Please keep on being awesome! Thanks for the garlic trick! I am definitely going to try this recipe this week! To remove the garlic smell just rub your hands/fingers in stainless steel under running water for a few seconds. You can use a spoon, a knife (of course be careful) or even the sides of you kitchen sink. Smell vanishes miraculously. Yum! Love the flavors and simplicity of this dish. I just bought a big package of chicken thighs, too! I am so glad you tried the garlic trick, I watched the same video recently! A friend of mine said that if two large bowls are not handy, two drinking glasses put together (like shaking a cocktail) also work. Thought that was excellent info. I’m trying this tonight. It sounds delicious! Ohhhh this looks so simple but like such a delicious combo. Spicy sweet goodness. Great job with your grill marks! I love your photos, it looks really clean. Thanks for providing great reading and inspiration for cooking! This looks so good and healthy! I need to make this dish. Lemon juice (and a little oil from the zest, twisted) will “neutralize” the garlic smell on your hands. And hewing parsley is an excellent way to abolish garlic breath. This looks absolutely Delish! Would love to give it a go. Yes! 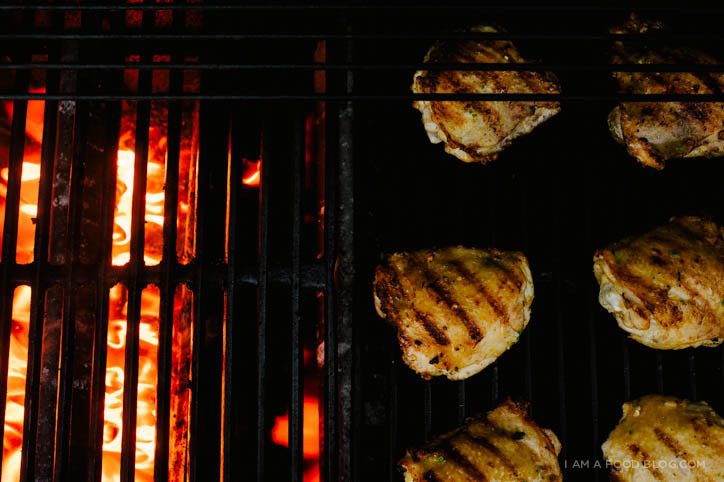 You can definitely use breasts, just keep an eye on them as they’re cooking – white meat tends to cook faster than dark. Let me know how it goes if you do give it a try! No need to have garlicky smelling hands. All you need to do is rinse your hands under cold running water whilst rubbing back and forth on a stainless steel implement. Works for onions too. Thank you for the recipe, looks delicious. Have to ask, how spicy does it come out? Need to know if for my daughter I’d have to skip the Jalapeno marinade. If you remove ALL of the seeds and ribbing from inside the jalapeños, it should be fine. Otherwise, just honey garlic is always good too! Hope she likes it! I wash my hand with baking soda and warm water after touching garlic or onions, and it works great to get rid of the smell. I haven’t tried it, but I think it would work quite well. The chicken won’t be as browned, but I think it’ll turn out super tender. Let me know if you give it a go! Could this be completed in a crock pot? Are these skin on thighs? Yes, skin-on, bone in. I’ve updated the recipe! Anyone try baking instead? any recommendations? If you’re not opposed to using a microwave, put the individual cloves of garlic in a small bowl and microwave for no more than about 6 seconds. Let cool slightly and the skins come right off. The 6 second time is from my memory so you may need to add a couple more seconds. I am not big on dark meat and therefore don’t like thighs. Can I just use boneless skinless breasts instead? I haven’t tried with boneless skinless breasts. I would just keep a close eye on the cooking time, breasts cook a lot faster! I just wanted to let you know that I found this recipe delicious, useful, and easy to follow. As a usually inept, and fairly lazy cook I was surprised out how well it came out the first time. It would have never occurred to me that honey would be a good ingredient, but the jalapeños provided a great balance within the dish. At first, I was puzzled as to what my side dish should be, and I figured rice pilaf was a simple and safe bet. The two made a great combination, and leftovers were scarce. It was refreshing to try such a savory recipe, because sometimes a box of Mac n’ Cheese doesn’t quite hit the spot. Generally, I have found your food blog helpful, because of the wide variety and fresh ideas for a meal. Plus, photos of the food look so damn appetizing and I really hate trying to hunt down good recipes on other websites. For instance, if you were to look up “chicken recipes” on the Google search engine, you would get a billion and one results from questionable sources, with pictures that actively discourage me from trying something different. Thanks again for taking the time to post this recipe, and I was happy that mine came out looking almost as appetizing as the pictures. Maybe not as lovely, though. I just wanted to mention that I found this recipe incredibly delicious, useful, and easy to follow. It would have never occurred to me to use honey as an ingredient, and a great balance is created when it is coupled with the jalapenos. Plus, you can never go wrong with garlic in my opinion. At first, I was puzzled as to what my side dish should be, but rice pilaf seemed like the simple and safe answer. The results were completely satisfying, and we had nothing left to spare. I was surprised by how much I liked this recipe first time trying it (I am prone to burn food). I have to admit my food didn’t look nearly as appetizing as the photos, but it was better than the box of Mac N’ Cheese I have sitting in the cupboard. Generally, I found your entire blog appealing, because I don’t have to weed through a billion and one recipes to find a good one, from a questionable source, and it is usually accompanied with a discouraging photo. This blog makes everything very accessible, and user-friendly. The photo’s (and the personal blurbs about garlic in- between)naturally encourage me to try the recipe because of how visually enticing they are. Thanks again for taking the time to post recipes for those of us who aren’t kitchen savvy! My stomach really appreciates it! Oven temperature and time of baking??? Oh my! I must try this!! Would this be good on a salad?? I AM definitely going to try this! Hi, I’m dying to try this out but I am a bit confused about the recipe. Should I finely chop the garlic? Leave it whole? MInce it? I just made this for dinner tonight and it was delicious! My husband usually prefers a sauce to go with his meat. Can you recommend an easy sauce that would compliment this chicken dish? i probably would double the sauce ingredients to make a bit of extra glaze with 2-3 cloves minced garlic, a diced jalapeño, 1/4 cup honey, a splash of soy sauce and water. in a small non-stick pan, heat up a touch of oil and gently cook the garlic until soft, but not brown. add the jalapeños, honey, soy sauce and water. bring to a simmer, stir and reduce a bit. hope that helps! The most confusing, bad recipe and directions I’ve ever seen. The ingredients look great. After that it’s useless !! I just picked up some of that honey the other day and had NO clue what I was going to do with it! This sounds delish! I will definitely be giving this a go! Oh man. I made these tonight. Best ever!!! I am adding this to my favorites. The family loved it!!! 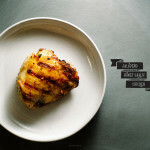 I was looking for a recipe using chicken and jalapenos, and stumbled across your blog. I wasn’t exactly sure about the flavor combination of garlic, jalapeno, and honey, but I made it anyway. It was delicious! wow, this looks so good and inviting. I am almost salivating. 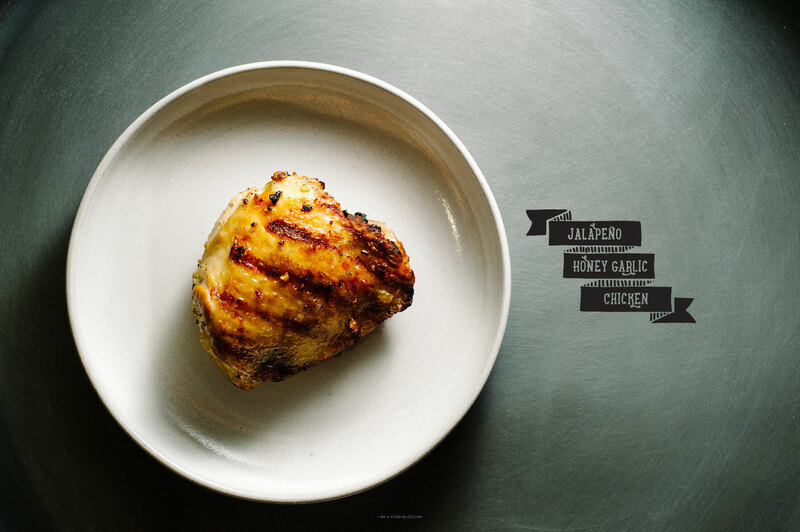 Love the char grilled marks. Honey & chicken is always a great combination. I saw this recipe which looked yummy and simple. At first my husband was skeptical that this wouldn’t be very flavorful because of the simple seasoning. I convinced him that we should try it and I’m glad we did, It was amazingly delicious! 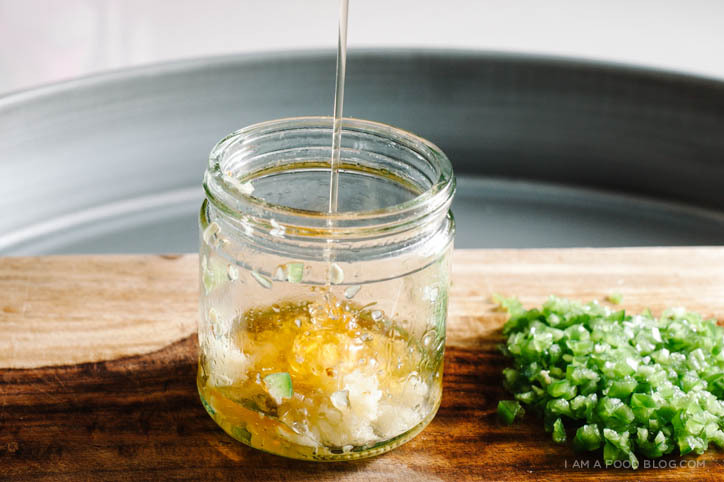 just any regular oil – i use grapeseed but canola will work too! Vietnamese Steak Summer Rolls Party!